How do you worship a homeless man on Sunday (Matt. 8:20; Luke 9:58) and ignore one on Monday? Why do you invite Jesus into your heart but not into your HOME (Matt. 25:44-45)? Why does the church throw a party for the police instead of the homeless (Luke 14:13)? I have been publishing an underground rag on the streets of Lubbock for a year and a half. I began publishing shortly before I got kicked out of church. From the start I developed a prayer routine, offering the same prayer on a routine basis which I have never stopped doing. I published the prayer itself many months ago. I think it was one of my publications that seemed to connect to homeless people largely because I pray for so many of them by name and indicated that in the publication too. People like to read their name in the paper, and though I disguised their identities, some of them could probably discern themselves in my list. But the part that I find the real punch of my prayer, the part where I petition God, is where I ask God to express himself in these prophets. I want them to bear the image of the suffering God who loves his world and redeems it. And then for Lubbock to respond to the image of God they see in these prophets. Then last winter I hear of a group called Taking It To The Streets who are loving the homeless in high style. Then the group Restoring Hope grew out of that, and I have joined them in ministry several times. 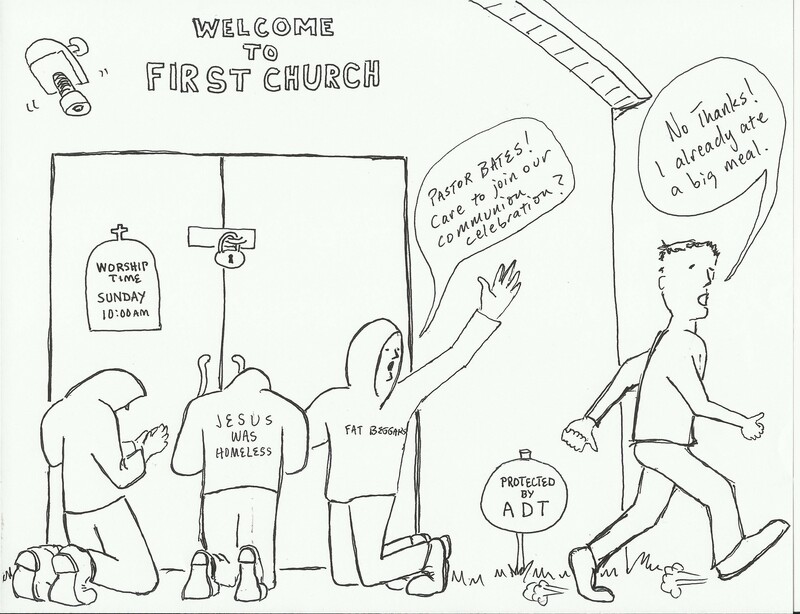 These groups find themselves in trouble with the established church along similar lines as I did. But they are Lubbock’s response to the image of God! They are an answer to my prayers! Then yesterday, I bumped into yet another street ministry. Mercy Corp. There is a complicated story behind my involvement with Mercy Corp that I will not lay out here, but I had not realized this ministry on the streets before yesterday. 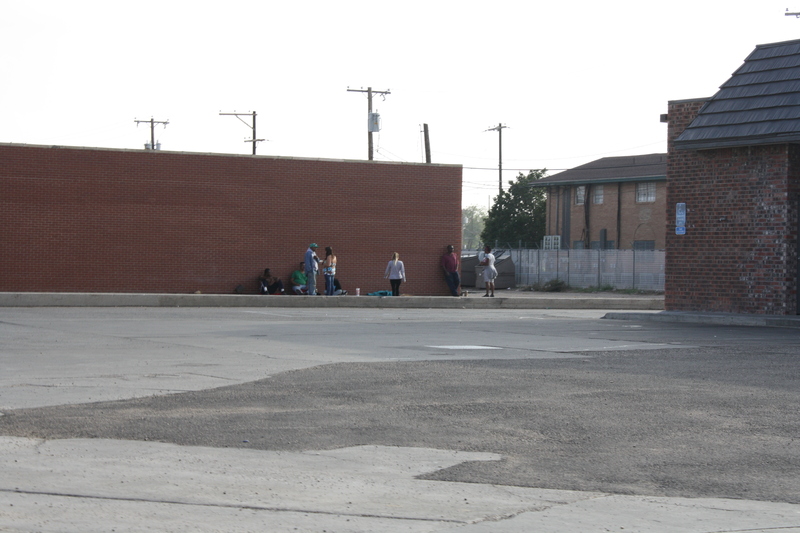 I was amazed at the heart this group brings to the streets. And I want to thank God publically for Restoring Hope and Mercy Corp. I notice lots of good work from the churches in this town too, but since they are entangled in their fears about “liabilities” and such things, we need people who are willing to respond in far riskier love. And I thank God for showing himself to Lubbock and drawing Lubbock closer to himself. It is an answer to prayer! If you see a bush near a locked up church after hours and think “bathroom,” You might be a homeless person! If your best friend treats the smell of urine like a fancy cologne, You might be a homeless person! 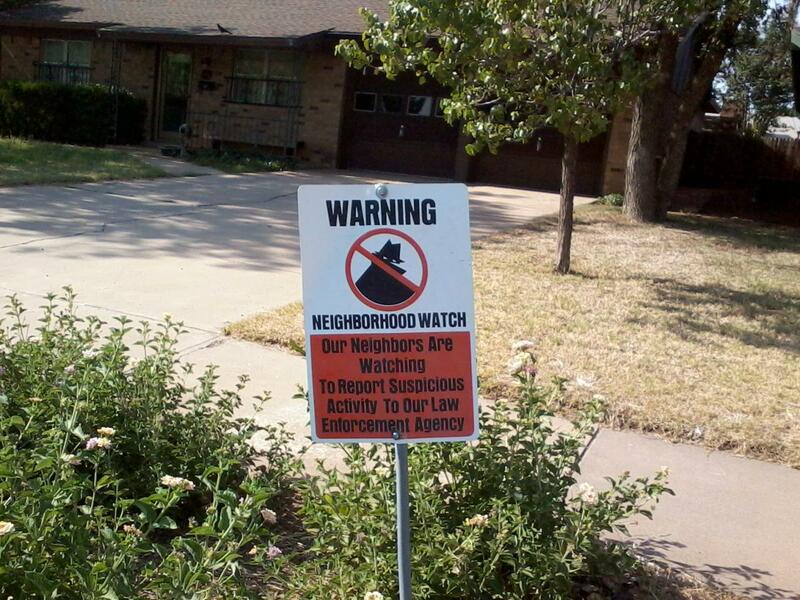 If you every time you set down a pack containing everything you own and your security system consists of keeping an eye on it, you might be a homeless person! I meet all kinds of homeless people. They come in all shapes and sizes. Some are rich; others poor. Some are crazy; others well-disciplined. Some are loud and obnoxious; others quiet and respectful. Some are leaders; other renegades. But nearly all of them (except for the very young) are divorced. And nearly all of the very young are children of divorce. I got divorced eight years ago. My life shattered. There is a lot of it I cannot remember. My wife left me and our place was no longer home. I became homeless. Some brothers and sisters at church came and took me in their home. If they had not, I would probably be on the streets today. I met lots of divorced people living very recklessly. Alcohol, drugs (prescription mostly), divorce-care at church with a pipeline to the night clubs and trap doors to cheap motels and “her place” all swirl together. Late nights, calling in to work, pulling your grocery buggy over on aisle 9 to have a quick cry. Some people manage to continue living indoors. Some lose it all and wind up on the streets. And once there, they fall off the map. But perhaps they are not so different from us. Perhaps we are not so different from you. Perhaps we have enough in common that if we humbled ourselves we might just see our long lost brothers and sisters behind those dumpsters and languishing in those back lots. You just might see yourself in them. And then you just might see Jesus in them (Matt. 25:40) and take Him home with you. And, Heaven help us, when He gets there, it might just be HOME (Ezek. 43). It’s probably just me, but I really don’t get it. 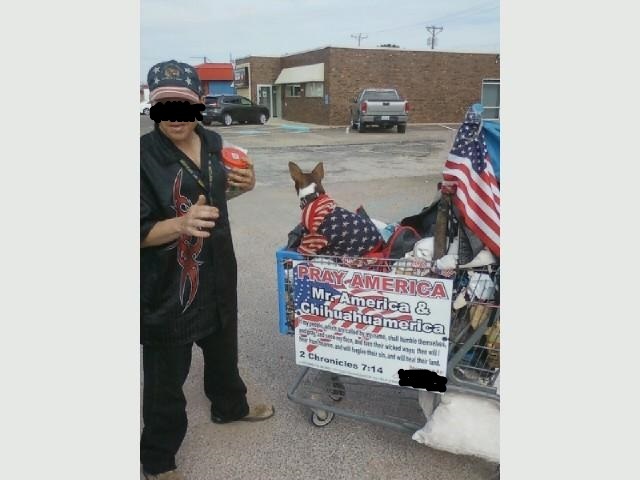 Why does a guy living on the streets in this country get so patriotic? What has this country done for him to win his heart, mind, and soul? I am guessing, and it may or may not be the case here, but perhaps it is easy to make a play on passions with all that red, white, and blue. Perhaps it’s a manipulative ploy. A guy like this will more likely play on your sympathy than a street person in a Megadeth shirt. But then maybe it is less innocuous. Maybe it gives him a sense of belonging since patriotism is the one thing he can really share with his rich neighbors. Too bad we can’t say as much for Jesus. Our “citizenship is in heaven” (Phil. 3:20), and Jesus’s “Kingdom is not of this world” (John 18:36). If those things mattered more, perhaps the patriotism would be a bit tempered? When you went to church last Sunday morning, did you drive past these people? Did you even notice them? But I am asking you to look again. These people are everywhere. And some of you drive right past them on your way to worship Jesus. Perhaps the sermon text will come from Luke 10:25-37. I went out on the streets with Special Agent J from Restoring Hope Ministries last night. This is the second time in two weeks that I have followed SAJ. I am blown away by all the new faces I am encountering. We are finding people in areas of town I have not seen homeless before. 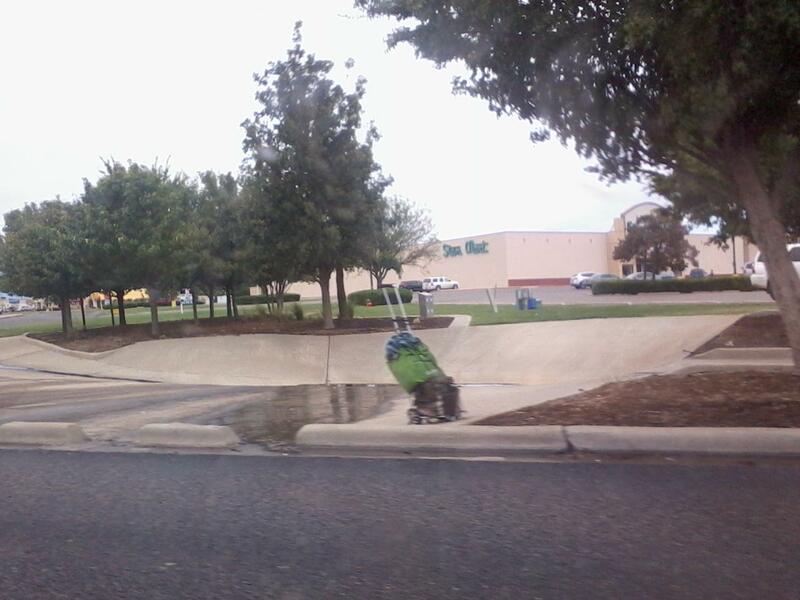 A few evenings ago, I was out on a quick errand at a place near my neighborhood, and I encountered a man with a buggy. I have seen homeless in my part of town before, but not in a very long time. He told me of two spots where he stays. 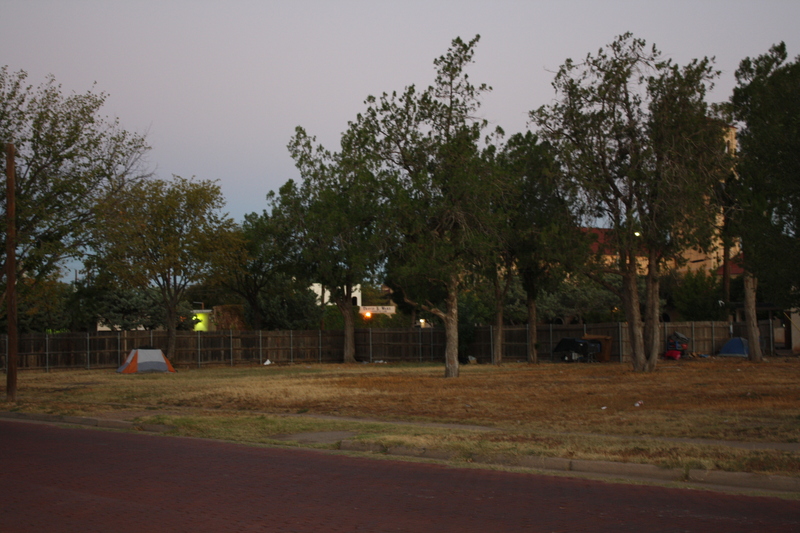 Lubbock is saturated with homeless beyond what I have imagined – and I have been looking out for them for five years! 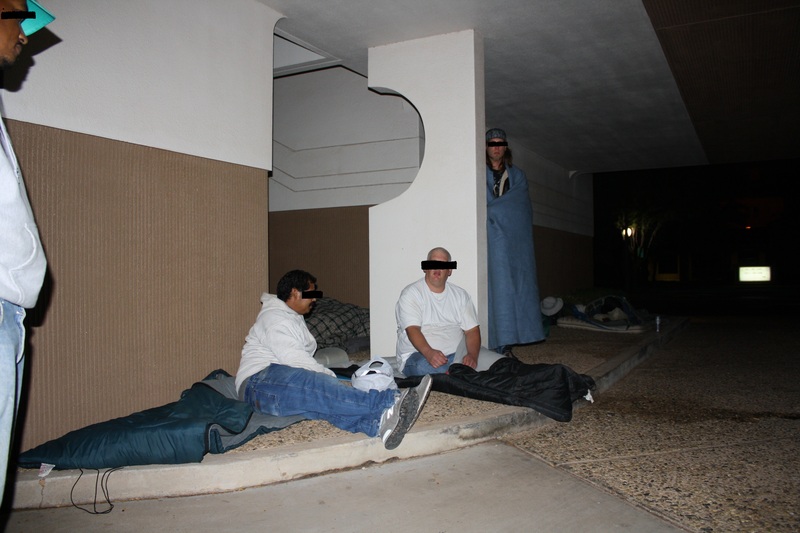 Why Are These People Sleeping Outside? It seems that you don’t go very far into street ministry before you run into sociologists and social workers everywhere. They all seem so wise. They have been there and done that. They know “what works and what doesn’t.” You are the rookie with a bleeding heart that will only hurt those you mean to help. And sure enough, the “streets are tough.” The poverty is “intractable.” Your gift of a few dollars is “enabling.” And the statistics are growing worse every day. It is easy to feel overwhelmed and ignorant. In fact, you are likely to bury your head in the sand the first time you get burned. For those who stay in the field, it quickly becomes apparent that giving a sandwich is wiser than giving $5. And those who see it this way almost universally think they have stumbled onto the wisdom of the ages. But as a Christian minister, I want to know what Jesus says about this. Even if I think the sociologists and social workers provide some wisdom, I really want Jesus’s wisdom even more – and that just might seem like foolishness to the wise (I Cor. 1:19-21). Why are these people sleeping outside? Is it because of addiction, mental illness, war-related PTSD, some other kind of PTSD, a down economy, or laziness? Yes. It is all of those. And the first five causes all have some built-in level of excusableness. It’s only the last one that pretty much warrants scorn – if it even does. And yet these people all suffer the stigma of the last one -laziness- whether it is the cause in part, in whole, or not at all. And there are plenty of war vets out there! But here’s another reason these people are sleeping out there… and on the great Day of Judgment, it is the only one that will matter. So those of you with Christian ears to hear, listen up! It is because you did not take Me in (says Jesus) when you did not take in the least of my brothers and sisters (Matt. 25:45). Fat Beggars School of Prophets proposes that you open up those church-house doors. Provide a chaperone and a meal. (You know, a meal like Jesus gave us?) And in so doing, you will bring these people in so that they are not sleeping outside, but in the sheepfold where Jesus wants them. “Behold! I stand at the door and knock. If you open up, I will come in and eat with you…” (Rev. 3:20). On that great Day of Judgment, what cause will you find for the intractable poverty? When the Shepherd King comes and finds the least of his brothers sleeping out in the cold, what answer will you give him? Will you join the sheep or the goats? Your sociology and your social work can’t cope with this.